We held hands and she fell asleep. Sometimes, all it takes is touch… a touch that lets you know, you’re not alone on this journey. Touch is so important for everyone. We are tactile people and the loving touch of a hand is sometimes all we need. Currently I am reading a wonderful book called “Still Alice” by Lisa Genova. Its a work of fiction, about a woman who has early onset Alzheimers Disease. What wonderful insight from her perspective. I highly recommend it. 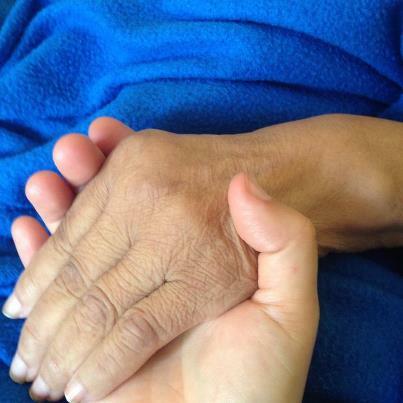 The caregiver’s perspective: a feeling that you’re not alone on the journey. The patient’s perspective: a feeling that he/she is not alone on the journey. My mom is no where as “gone” as your Mom. My mom has logical days, knows me, and is still herself. She has short term memory, so one track sticks over and over and over. She has health issues such as kidney failure and replaced hip so she won’t try and walk due to pain, and so is wheelchair bound by her own choice. But I’ve read and studied so much to be sure I know where we are headed and how to deal. I read all the blogs I can. Loved “theDementiaQueen” ‘s blog and highly recommend it. Yours is great too, and I want to comment on the “touch” issue. From my research I saw how important it is, so I make a point of hugging my mom and kissing her forehead and cheek alot when I visit. And I can tell it has made a huge change. She softened and sweetened and tells me how much she loves me, etc. I highly recommend touch. Thanks again.